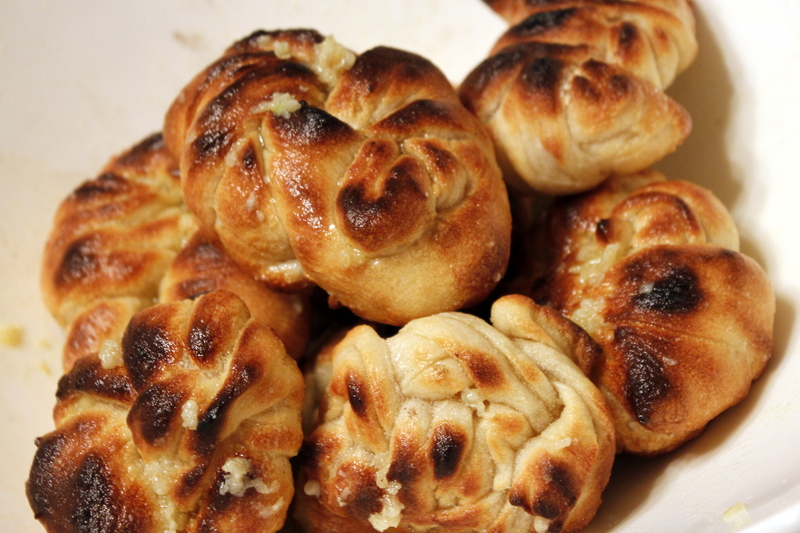 Ah the humble garlic knot. These are a sure-to-find on the menu of any good pizza place. The concept is simple and they're simple to make once you have the pizza dough. You start with the dough, tie a knot, bake it, toss it in some garlic, butter, oil, and salt - and that's it, you're done... Bread, butter, and garlic -- what else do you need. I never started ordering garlic knots regularly until sophomore year of college. We found a pizza place in Harvard Square that served $5 pitchers of beer, which, for Cambridge, was one hell of a deal. The roommates and I partook often. The caveat was that you had to order food to be able to drink. 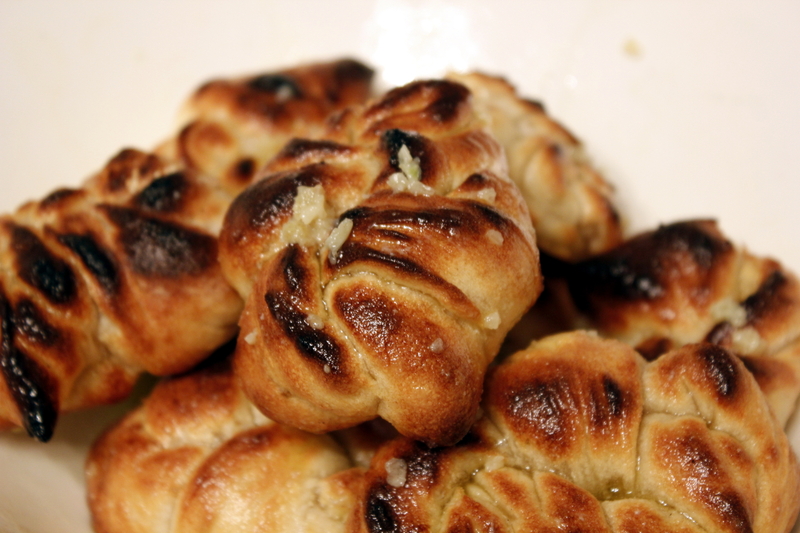 No one wanted to spend 15 bucks on a pie so we defaulted to the cheapest item on the menu: garlic knots. Tasting these brought me right back to that little "Crazy Dough's" restaurant, up the escalator, in "The Garage." 1. Combine water, buddy, oil, and yeast in a large bowl. Add salt. Slowly alternate adding flour and mixing until dough forms a ball. Continue adding flour until you have formed a ball that is soft but not sticky. Turn out onto floured board and knead with floured hands for 10 minutes (or use dough hook on machine at lowest setting for 5 minutes). 2. Coat dough in olive oil, place in bowl, cover with plastic wrap and refrigerate overnight. 3. Remove dough from fridge 1 hour before you are ready to begin cooking. 4. Place stone on top rack and preheat oven to broil (also one hour before cook time). 5. Gently stretch dough by hand into a the best pizza you can make, use as much flour as you need (mine came out like an ugly egg). 6. Using a pizza cutter or floured sharp knife, cut 4in by 2in strips or as close to those measurements as possible. 8. Place all sauce ingredients into microwave safe bowl, cover and microwave for 2-3 minutes. 9. Place knots on stone. Check in 3 minutes. If golden brown, remove from oven - if not, check again every minute until they are. 10. Toss with garlic butter and enjoy. Note: If you have a favorite pizza dough, you can definitely start with that to save yourself some time. I encourage you to try the homemade sourdough, though - it is worth the time investment.